The ACA Board at the awards ceremony. 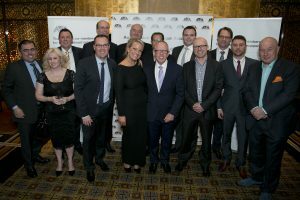 Woolworths Supermarkets and its Dan Murphy’s liquor division have been recognised for their success in catalogue marketing at the Australasian Catalogue Association (ACA) 24th annual awards. The 2015 awards were held on the 21st August 2015 in Melbourne and saw Woolworths win the heavily contended Supermarkets award for ‘Meadowbrook’s Fresh Food People’ campaign produced by Leo Burnett. To win the award, Woolworths competed against: Coles with its ‘Coles Alexander Heights – Store Renewal’ produced by Coles In-house Team; Romeo’s Retail Group for ‘Everyday Christmas Value – Dec 2014’ produced by Martin Plunkett Design; and ALDI ‘Special Buys Week 42’ produced by BMF. Woolworths also made it to the final four for ‘Catalogue Retailer of the Year’ but was beaten by Dan Murphy’s. Dan Murphy’s won for its combined catalogue work produced by the Red Jelly agency. The brand also won the ‘Technology on Paper – Effectiveness’ Award. This was awarded to Dan Murphy’s ‘Champagne & Sparkling Discovery’ publication which included augmented reality technology. Red Jelly were also nominated for Agency of the Year but missed out to Whybin/TBWA for its work on behalf of retailer David Jones.